The Morin Research Group applies classical concepts in surface chemistry and polymer mechanics to enable innovative approaches to the fabrication of adaptive, hybrid polymer microstructures with various functionalities (e.g., sensing, actuation, etc.). Central to these activities is the design and synthesis of chemically functionalized, mechanically tunable elastomer films: Stretchable Chemical Templates. These materials provide active, dynamic control over 2D and 3D chemical environments for the manipulation of microscopic surface properties/processes (e.g., surface chemistry and microstructure, mass transport, and particle-particle interactions). This approach has led to the discovery of new methods to control (i.e., synthesize, assemble, manipulate, etc.) nano-/micro-scale structures comprised of liquids, solids, and gels rationally, thus enabling new varieties of hybrid, adaptive, functional materials generally applicable to an array of technologies from soft sensors to actuators. Some of the group’s recent activities, which highlight the potential of stretchable chemical templates in new modes of soft matter fabrication relevant to this discussion, have been reported in Advanced Functional Materials, Small, and Angewandte Chemie. The ability to fabricate polymeric microstructures with rationally controlled geometry and composition would be generally useful to an array of technologies (e.g., sensing,[4-5] microactuation, robotics,[7-8] etc. ); however, methods applicable to the generation of such structures struggle to control both geometry and composition simultaneously. These fabrication challenges are particularly pronounced when smaller dimensions, heterogenous compositions, and large amounts of products are desired. Traditional methods of microfabrication, such as photolithography, micromolding, or micromilling, are versatile mainstays, but generally require planar substrates, unique masters, extensive step-wise processing, or expensive/specialized instrumentation which limit process adaptability, material compatibility, and scalability. The toolset encompassed by soft lithography (e.g., replica molding, microcontact printing, micromolding in capillaries, etc.) has worked to address many of these challenges, especially in soft matter microfabrication, but must continue to advance to meet all the requirements presented by the range of emergent applications that rely use polymer microstructures (e.g., in soft robotics, stretchable sensors and electronics, smart adhesives, etc.). In particular, the relatively static nature of the surface chemistry and microstructure of traditional soft lithographic masters (e.g., PDMS stamps) are characteristics that introduce process limitations. 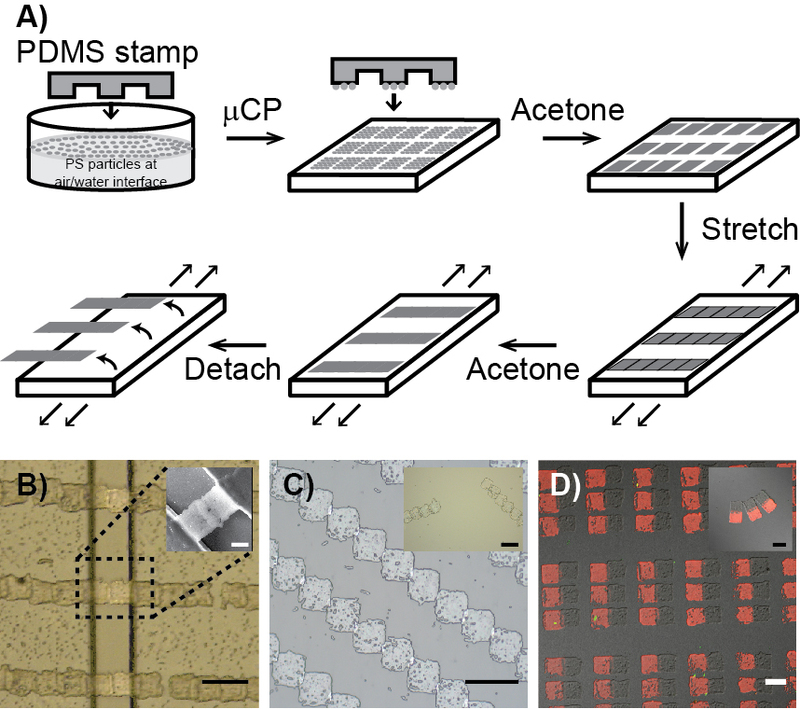 Stretchable chemical templates, the focus of this discussion, provide dynamic surfaces that address these weaknesses, enabling in new soft lithographic tools (Surface Molding and Surface Assembly) for the scalable fabrication of functional polymer microstructures with a diversity of compositions and geometries. The generation of stretchable chemical templates was first reported by the Morin Group in Advanced Functional Materials (Figure 1). The approach begins by activating the surface of silicone elastomers (PDMS, Sylgard 184) using oxygen plasma to give silanol groups for use subsequent conjugation reactions (Figure 1A). 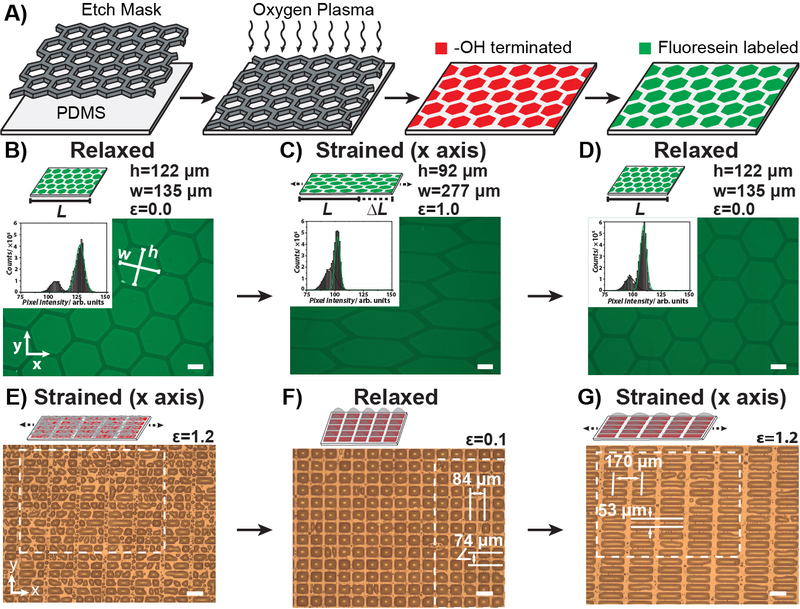 This work illustrated, for the first time, that it was possible to remove brittle silica from oxidized PDMS, maintaining elasticity of the surface and the necessary reactive groups for surface derivatization. The reversible deformations of the resulting stretchable chemical templates was demonstrated using fluorescently labeled surfaces (Figure 1B-D). These surfaces were used to assemble and manipulate liquid droplets with dynamic lensing functionality (Figure 1E-G). Figure 1. A) Schematic illustration of the synthesis of stretchable chemical patterns. B-D) Fluorescent micrographs over the course of one strain cycle (ε = 0-1.0) of PDMS labeled with a fluorophore. Insets provide histogram analysis of each image, illustrating intensity shifts associated with deformation. Scale bars are 50 μm. E-G) Optical micrographs showing the assembly and manipulation of ethylene glycol microdroplets (volume ~ 50 pL) using a stretchable chemical template. Scale bars are 100 μm. Adapted from reference . The scalable assembly and manipulation of liquid microdroplets demonstrated in these early investigations became the foundational technology for a new soft lithographic microfabrication procedure termed “Surface Molding” (Figure 2A). In surface molding the stretchable chemical templates are pre-strained and spray-coated with prepolymer microdroplets, which are then directly assembled into arrays of microdroplets with well-defined geometries following release of mechanical strain. The prepolymer microdroplets are then crosslinked yielding the desired polymer microstructures (crosslinking can be carried out chemically, optically, or thermally depending on the formulation of the prepolymer—photocurable hydrogels such as polyacrylamide were emphasized in this work). Mechanical reconfiguration of the stretchable chemical template (and thus the prepolymer droplets) during crosslinking can be used to produce “families” of related microstructure with different geometries from the same template. Figure 2. A) Schematic illustration of Surface Molding. B-E) Optical micrograph showing the processing of liquid pre-polymer microdroplet using Surface Molding: B) Depostion, C) Strain release and assembly, D) Photo-initiated crosslinking, and E) Release. All scale bars are 50 μm. Adapted from reference . The Morin Group applied surface molding to the fabrication of millimeter-scale soft actuators with programmable motions, where the specific motions of each actuators were easily controlled by modifying the geometry of the hydrogel arrays. This process did not require the generation of unique templates or modifications to the fabrication workflow, rather the dynamic/tunable nature of stretchable chemical templates was used to produce the various actuators from an equivalent starting point—a capability unique to surface molding. In these devices it was the interfacial stress on the PDMS support (which can be isotropic or anisotropic depending on the geometry of the hydrogel array) that results from dehydration of the hydrogel which drove actuation and defined the equilibrium morphology of different hydration states (Figure 3). Figure 3. A) Schematic illustration of the operation of a soft actuator based μ-gels assembled using surface molding. The force balance that causes actuation is illustrated for one gel (dotted box). B) Optical micrographs looking down the x axis of a linear actuator in a high humidity environment and C) a low humidity environment. D) Optical micrographs looking down the z axis of a linear actuator in a high humidity environment and C) a low humidity environment. Scale bar is 1 mm. Adapted from reference . Solid microparticles can also be manipulated and assembled using stretchable chemical templates (Figure 4A). In this procedure, the Poisson effect was leveraged to bring microscale solid objects into contact with one another, and chemical “welding” procedures (e.g., solvent-vapor annealing) were used to fuse the microparticles into larger polymer microstructures (up to millimeters in length). Release of these structures from the stretchable chemical templates, yielded free standing polymer microstructures of rational designs (Figure 4B-D). The guiding information for the assembly of such hierarchical polymer microstructures was encoded in the deformation of the substrate, making the assembly of numerous microscale objects simple and scalable. This method is applicable to organic and inorganic crystals, hard and soft polymeric structures, and metallic particles. 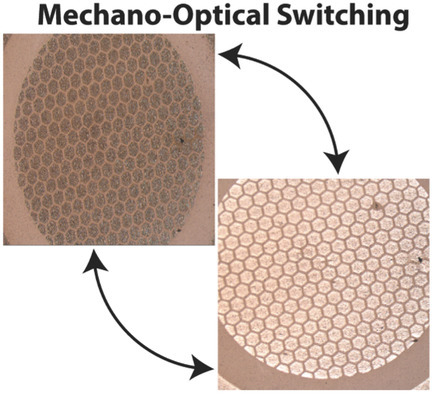 In the initial demonstration, surface assembly was used to fabricate microstructures with heterogenous optical, catalytic, and/or mechanical properties (Figure 4B-D). A unique feature of this mode of fabrication is the scale of assembly possible: 106 microparticles are assembled to form 101 mesostructure corresponding to a range of length scales of 103 (μm to mm) and a factor of 105 in terms of building units. Figure 4. A) Schematic illustration of surface assembly using stretchable chemical templates. B) Optical micrograph of millimeter scale polystyrene microstructures with side to side contacts bridging a gap. Inset is an SEM micrograph of a single polystyrene microstructure bridging a gap. Scale bars are 100 and 25 μm. C) Optical micrograph of millimeter scale polystyrene structures with edge contacts defined by off-axis deformation of the surface chemical template. Inset is a micrograph of released structures. Scale bars are 100 μm. D) Overlay of bright field and fluorescent micrograph of an assembled polystyrene microstructure where one of the building units was fluorescently labled. Inset is a micrograph of the released microstructure with potential application in optical bar coding. Scale bars are 100 μm. Adapted from reference . 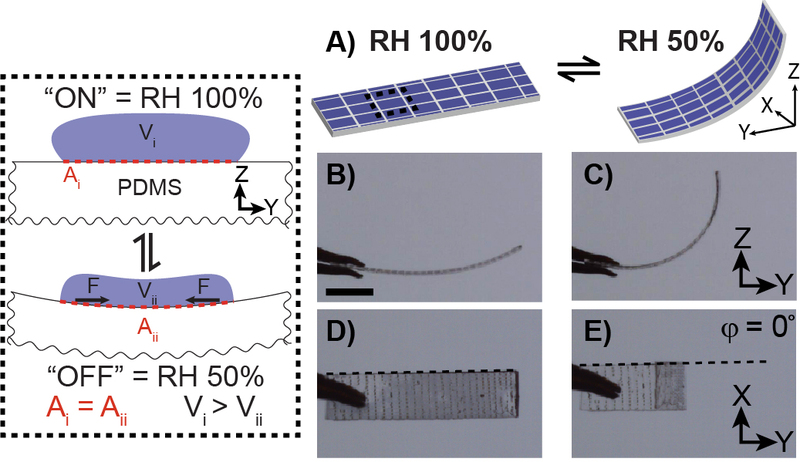 Stretchable chemical templates provide the basis for range of new soft microfabrication tools. As discussed here, stretchable chemical templates and the associated fabrication techniques (surface molding and assembly) provide a range of unique advantages: (i) Scalability: production scales geometrically with the size of the processing template (106 microstructures are readily produced using centimeter-scale surfaces); (ii) Reconfigurability: mechanical deformations of the stretchable chemical templates enables the fabrication of different microstructures from one starting point (unique patterns are not necessary for different iterations); (iii) Flexibility: the feedstock for this procedure is versatile and can be liquid, solid, or combinations of both where a wide range of chemical variations and filler combinations enable a diversity of unique material products; and (iv) Simplicity: electromechanical devices with macroscale precision can be directly applied to microscale manipulations in the fabrication of different microstructures. The Morin Group is continuing to expand the capabilities of stretchable chemical templates in order to fabricate an even wider range of microstructured polymers, composites, and ceramics, with applications in, for example, microactuation, sensing, and adaptive surface coatings. In this pursuit, key challenges remain: (i) Surface chemistry: Initial work has focused on a relatively limited variety of surface functional groups (e.g., hydroxyl and amine groups), expanding the repertoire of surface chemistries to include more functionalities will increase the reach of surface chemical templates to different prepolymer formulations and solid building blocks. The application of robust conjugation chemistries (e.g., click reactions, EDC/NHS coupling, etc.) will provide access to more surface functional groups from commercially available reagents. Furthermore, functionalization schemes (e.g., those used in DNA microarray technologies) that can produce templates with multiple chemistries rapidly will simplify the production of heterogeneous microstructures; (ii) Elastomer chemistry: Silicones (e.g., PDMS formulations including Sylgard 184 and Ecoflex) have been investigated, however, this choice introduces limitations derived from solvent compatibility and contamination (silicones are known to leach uncured monomer during mechanical deformation). The use of different elastomers (e.g., thermoplastic urethanes) could work to eliminate some of these limitations; (iii) Elastomer mechanics: The magnitude of strain accessible is fundamentally limited by the yield point of the elastomer supports, which in turn limits the magnitude of liquid/particle manipulation possible following the described approaches. The stiffness of the elastomer supports determines the force requirements of the electromechanical tensioning devices used in assembly. Silicones work well at the scales described herein, but more ideal support substrates would have elastic limits at higher strains and lower Young’s moduli; and (iv) Deformation axes: Stretchable chemical templates have been operated using uniaxial deformations; however, multi-axial or omni-axial deformations will allow for micromanipulation of the liquid/solid building units over a more complete range of trajectories supported by the mechanics of the elastomer supports. J. J. Bowen, J. M. Taylor, C. P. Jurich, S. A. Morin, Adv. Funct. Mater. 2015, 25, 5520-5528. T. P. Vinod, J. M. Taylor, A. Konda, S. A. Morin, Small 2017, 13, 1603350. J. J. Bowen, M. A. Rose, A. Konda, S. A. Morin, Angew. Chem. Int. Ed. 2018, 57, 1236-1240. M. Q. Jian, K. L. Xia, Q. Wang, Z. Yin, H. M. Wang, C. Y. Wang, H. H. Xie, M. C. Zhang, Y. Y. Zhang, Adv. Funct. Mater. 2017, 27, 1606066. L. J. Pan, A. Chortos, G. H. Yu, Y. Q. Wang, S. Isaacson, R. Allen, Y. Shi, R. Dauskardt, Z. N. Bao, Nat. Commun. 2014, 5, 3002. S. Rekstyte, D. Paipulas, M. Malinauskas, V. Mizeikis, Nanotechnology 2017, 28, 124001. J. C. Breger, C. Yoon, R. Xiao, H. R. Kwag, M. O. Wang, J. P. Fisher, T. D. Nguyen, D. H. Gracias, ACS Appl. Mater. Interfaces 2015, 7, 3398-3405. H. Yuk, T. Zhang, G. A. Parada, X. Liu, X. Zhao, Nat. Commun. 2016, 7, 12028. H. Sato, Y. Houshi, S. Shoji, Microsyst. Technol. 2004, 10, 440-443. M. Heckele, W. K. Schomburg, J. Micromechanics Microengineering 2004, 14, R1-R14. D. J. Guckenberger, T. E. de Groot, A. M. D. Wan, D. J. Beebe, E. W. K. Young, Lab Chip 2015, 15, 2364-2378. Y. Zhang, C. W. Lo, J. A. Taylor, S. Yang, Langmuir 2006, 22, 8595-8601. J. L. Wilbur, A. Kumar, E. Kim, G. M. Whitesides, Adv. Mater. 1994, 6, 600-604. E. Kim, Y. N. Xia, G. M. Whitesides, Nature 1995, 376, 581-584. T. Ranzani, S. Russo, N. W. Bartlett, M. Wehner, R. J. Wood, Adv. Mater. 2018, 30, 1802739. H. Li, Y. Ding, H. Ha, Y. Shi, L. Peng, X. Zhang, C. J. Ellison, G. Yu, Adv. Mater. 2017, 29, 1700898. E. P. Chan, E. J. Smith, R. C. Hayward, A. J. Crosby, Adv. Mater. 2008, 20, 711-716. Permalink Submitted by smorin on Thu, 2019-01-31 10:26. Permalink Submitted by Philipp Rothemund on Tue, 2019-02-12 00:48.
this is very interesting work. Have you ever tried to use this technique to fabricate 3D-structures? For example by coating the entire surface with a material that only bonds to the chemical template, so that when the substrate relaxes the material between the bonded areas can buckle out of plane. Permalink Submitted by smorin on Thu, 2019-02-14 14:13. Thanks for the comment! We have done some work with 3D (wrinkled) structures using an approach similar to what you've described (Taylor et al. Adv. Mater. 2016, 28, 2595-2600). The interesting result here was that, by controlling the thin-film microstructure of the hard overlayer using strain, you could access mechano-optical effects. Namely the transition from reflective to scattering states. Using this concept we created "skins" with locally switchable reflectance (see Fig. 4 and Video S5). I think the TOC nicely captures this concept. We are continuing to build on this concept to manipulate polymer micromaterials. Permalink Submitted by smorin on Thu, 2019-02-14 14:16. Permalink Submitted by Nicholas Kellaris on Wed, 2019-02-13 18:17. Thanks for posting your work here, it is very interesting and beautifully done. We've actually used some of your techniques for bonding thermoplastics/elastomers in the past, so thank you! 1) Relating to the assembled PS structures - are their mechanical properties fairly uniform, or do you notice weakness at the bonded interfaces? Also, have you tried a multi-step process for bonding these structures (with sequel stretching in various directions) in order to create two-dimensional structures? 2) I can envision using your chemical templates to create microscale electrostatic actuators. In particular, we work on HASEL actuators, which are simply a polymer pouch filled with liquid dielectric, and electrodes on the outside. It seems like your process could be used to create tunable microscale HASEL actuators by precisely defining regions wetted by the liquid dielectric. Haven't figured out how you bond another polymer layer over that yet =). Anyway, has your group ever tried making electrostatic actuators using this process, or have you only explored humidity-sensitive actuators thus far? Again, very cool work. Thanks for sharing. Permalink Submitted by smorin on Thu, 2019-02-14 14:35. Thanks for the comments! I'm glad to hear that our bonding work is finding use outside our lab! I've pasted in your questions with responses below. We looked at the strength of the weld in some detail and found it approached that of the PS islands, but that indeed that was the weak site of our structures (i.e., where they would break). This was covered in the SI (pg. S15, Figure S6). The take home message: the Young's modulus for the weld was 19.8 MPa where the films maxed out at 36.6 MPa. For the second part (sequential processing), yes, we did try that and it works. We have not yet published these results, but stay tuned! We have (and have a manuscript close to submission describing this) looked at actuators that are light responsive, magnetic responsive, and humidity responsive, but nothing using electric fields or electrostatics. Your suggestion is very interesting! I know we have successfully created "capsules" using our approach, so that could, in principle, be a way of containing the liquid dielectric, and we have also deposited metals (gold, silver, copper) on these surfaces, so that would be the electrode. I'd love to discuss further as it seems the answer is yes, micro-HASEL actuators may be possible following these strategies.